If you are fortunate enough to use the highest offered VS.NET edition inclusive of additional testing abilities, or purchased a license to a product such as dotCover then you already have access to unit testing code coverage tools. However there is still an easy and powerful way to get the same type metrics using a combination of msbuild.exe and (2) open source tools: OpenCover and ReportGenerator. OpenCover will leverage msbuild.exe and analyze code to determine the amount of code coverage your application has in reference to the unit tests written against it. ReportGenerator will then leverage those results and display them in a .html report output that is generated. The really cool part of it all is that since it is all scriptable, you could make the output report an artifact of a Continuous Integration (CI) build definition. In this manner you can see how a team or project is doing in reference to the code base and unit testing after each check-in and build. A quick word on what this post will not get into - What percentage is good to have that indicates the code has decent coverage? 100%? 75%? Does it matter? The answer is, it depends and there is no single benchmark to use. 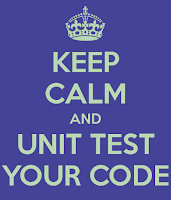 The answer lies in the fact that one should strive to create unit tests that are are meaningful. 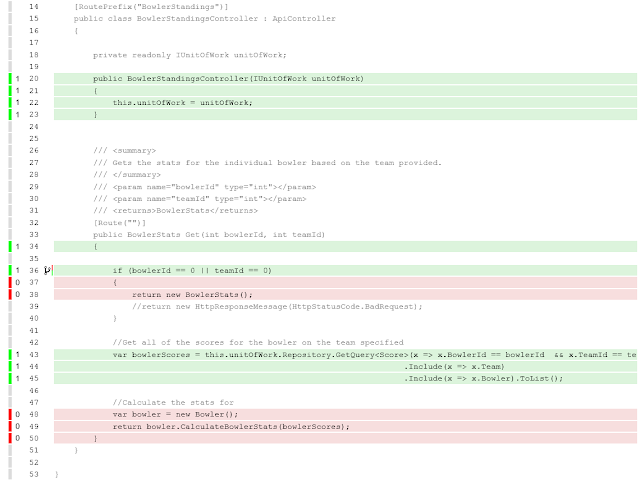 Unit testing getters and setters to achieve 100% code coverage might not be a good use of time. 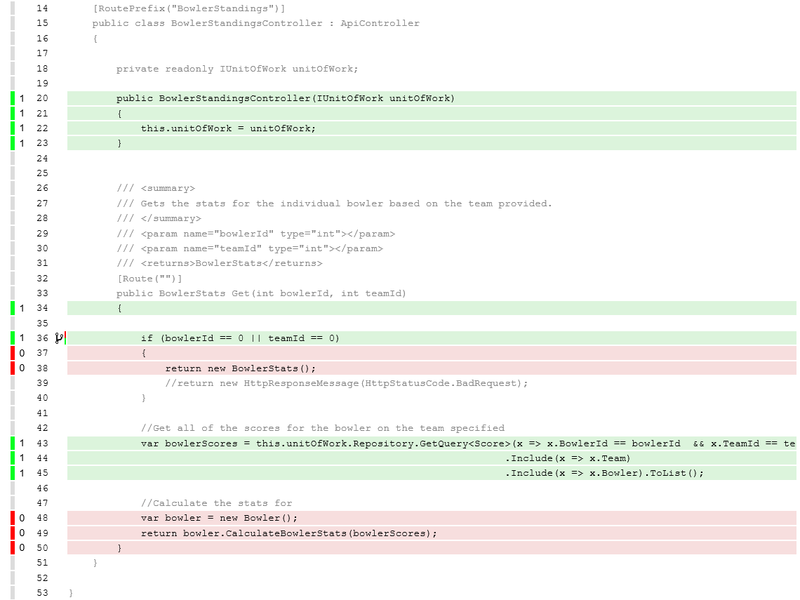 Testing to make sure a critical workflow's state and behavior are as intended are examples of unit tests to be written. The output of these tools will just help highlight any holes in unit testing that might exist. I could go into detail on percentages of code coverage and what types of tests to write in another post. 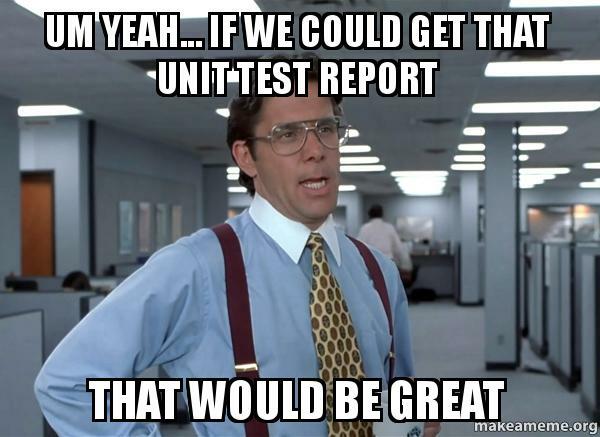 The bottom line - just make sure you are at least doing some unit testing. 0% is not acceptable by any means. Prior to starting, you also can get this script from my 'BowlingSPAService' solution in GitHub within the BowlingSPA repository. You can clone the repository to your machine and inspect or run the script. Run the script as an Administrator and view the output. Download and import the following (2) open source packages from NuGet into your test project. If you have multiple test projects, no worries. The package will be referenced in the script via its 'packages' folder location and not via any specific project. The test projects output is the target of these packages. The documentation you'll need to refer to most is for OpenCover. It's Wiki is on GitHub and can be found at the location below. ReportGenerator doesn't need to be tweaked so much as it really just displays the output metrics report in HTML generated by OpenCover. This was my guide for creating the batch file commands used in this article. I prefer to place these types of artifacts in a 'Solution Folder' (virtual folder) at the root to be easily accessible. Note: Make sure the file versions in this script code are updated to match whatever NuGet package version you have downloaded. I've added some filters that will add anything in the 'BowlingSPAService' namespace, but also removing code in the 'BowlingSPAService.Tests' namespace as I don't want metrics on the test code itself or for it to show up on the output report. Note: these filters can have as many or few conditions you need for your application. You will after getting familiar with the report probably want to remove auto-generated classes (i.e. Entity Framework, WCF, etc.) from the test results via their namespace. Calls ReportGenerator.exe from the packages directory (NuGet), providing the output .xml report file genrated from #3(a) above, and specifying the output target directory folder to generate the index.htm page. Note: if IE is used, you will be prompted to allow 'Blocked Content.' I usually allow as it provides links on the page with options to collapse and expand report sections. IF EXIST "%~dp0BowlingSPAService.trx" del "%~dp0BowlingSPAService.trx%"
FOR /D /R %%X IN (%USERNAME%*) DO RD /S /Q "%%X"
By selecting an individual class, you can see a line level coverage visually with red and green highlighting. Red means there isn't coverage, and green means there is coverage. This report and visual metric highlights well when unit tests have probably only been written for 'happy path' scenarios, and there are unit test gaps for required negative or branching scenarios. By inspecting the classes that are not at 100% coverage, you can easily identify gaps and write additional unit tests to increase the coverage where needed. 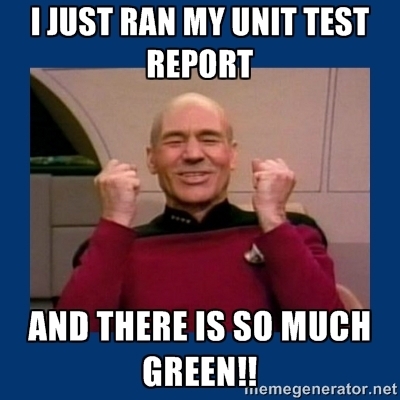 After adding or modifying unit tests, you can run the report again and see the updated results. Questions about the particulars of how the metrics are evaluated are better directed toward the source for OpenCover on GitHub. 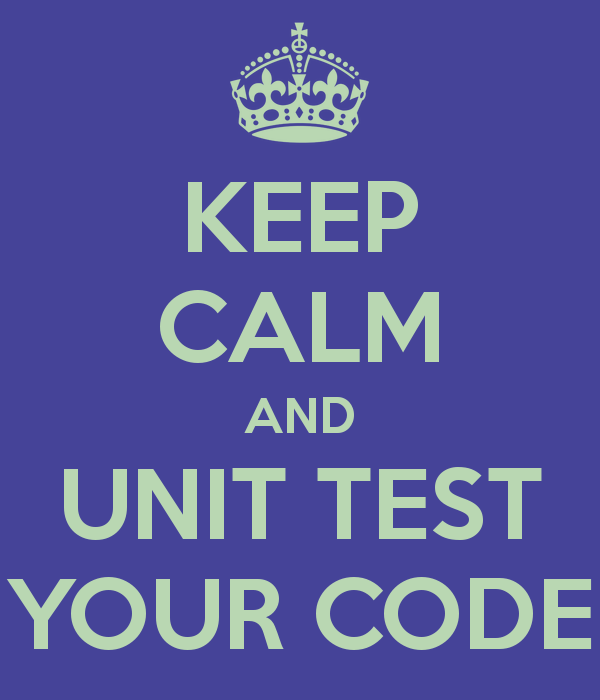 That's all you should need to get up and running to generate unit test metrics for your .NET solutions! As mentioned previously, you might want to add this as an output artifact to your CI build server and provide the report link to a wider audience for general viewing. There are also additional fine tuning options and customizations you can make so be sure to check out the OpenCover Wiki I posted previously. In the line-level coverage report, what do the numbers in the margin signifiy? In your example they are either 0 or 1. Is this a boolean indicating that the line has coverage? Is it the number of times the line was reached in all unit tests? Is something else? 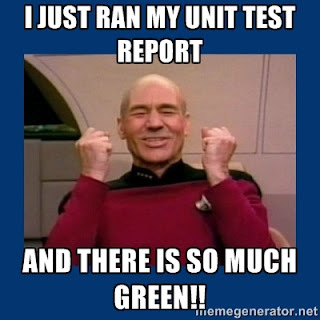 Your blog is very helpful for generating Unit Test Code coverage report. I am able to generate report for single dll but my project has multiple dlls , so I am facing the issue to generate combined report for multiple dlls. This is great. Thank you. But you skipped over the part about how to run it. I get how I can integrate it into a CI server. But how do I run it locally when I want to see if i need to create more unit tests? Do I open a standard command window? The script seems to be using some VS env vars so I assume it needs to be launched from VS somehow. Yes, this process is creating a .bat (batch) file. You can just double click the batch file from explorer, and if it is set up correctly the commands within will execute and the very last step is to auto open the report. Now if you run the .bat file and nothing happens that means there is an error. To debug, make sure the command window doesn't close itself. Ok, I figured out a couple things that I had wrong. And all the nuget packages put their binaries in a directory called tools so the paths had to be altered for that. I then added it as an "External tool" under the Tools menu. I can now launch it any time from within VS by selecting the new menu item. Thank you very much for taking the time to write this blog. It was very helpful! i want to find out code coverage of application which is test by automation code. e.g. my automation script code (written in c#) has a login method which perform login to XYZ application using selenium c#. now i want to know how much my login(automation code)method effects to XYZ application like, how many line of code are executed and other features which normally code coverage tools providing. @pause ) so that I can run Allen Conway's batch file with my batch file. The command prompt opens but nothing happens after that. Could someone help me with this? Also I guess it has something to do with what Greg Veres has posted above. I did have to change my VS version like Greg mentions above. Also, in newer versions of OpenCover and ReportGenerator the .exe's moved to the /tools folder. So..
You may also need to alter the paths a bit to match your solution. Excellent tutorial. I could make it work thanks to you. It was very helpful!